Progress on painlessbiopsy project | Emilian Snarski M.D. Ph.D.
← Finally – Jack Andraka on TED on his new testing method. There is progress on painlessbiopsy.wordpress.com project. If you want to proof your skills – database and questionnaire are ready and avaliable upon request. The questionnaires and databases are in English and Polish. My experience with filling the database was that I suddenly discovered that there is some pain which associated with anesthesia – and somehow this is probably the most painful moment during the whole procedure – I know what I have to work with now. So I hope I can make that better with future patients. The whole ideas is to see who is good at what part and be able to learn from that person. If you are interested in joining in the project – as a doctor or maybe as a patient – please contact us. 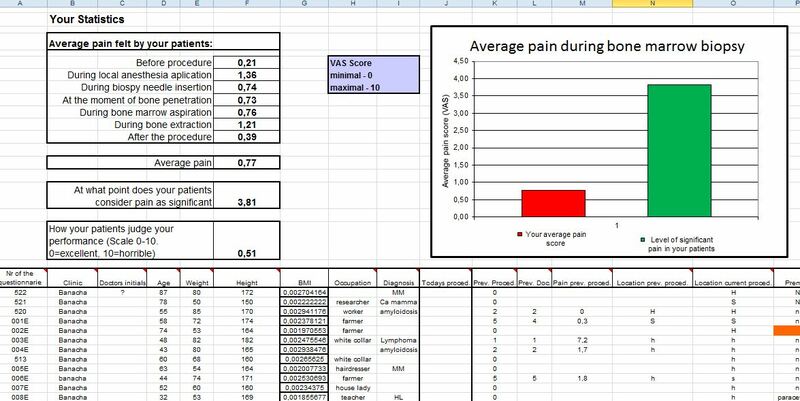 The database analyses the pain during the bone marrow biopsy once the data of patient is filled into the questionnaire. Here is what it looks like – the data comes from my first 16 patients.